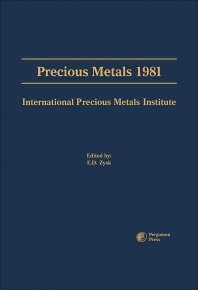 Precious Metals 1981 presents the significant role of precious noble metals in various aspects of human life. This book discusses the wide array of uses of precious metals from dental fillings to the manufacturing of air conditioners. Organized into nine parts encompassing 48 chapters, this book begins with an overview of the chemical reducing capability of sodium borohydride for various organic heavy metal applications. This text then examines the general plant operations comprising of heap leaching methods utilized for the recovery of finely dispersed particles of gold and silver. Other chapters consider the refining characteristics of gold alloys containing impurities. This book discusses as well the fundamental principles of major conventional bonding methods used to produce metal clad materials used in jewelry and electrical contact applications. The final chapter deals with the precious and non-precious alloy systems used in Dentistry. This book is a valuable resource for engineers, jewelers, and goldsmiths.